The body has certain points that are more sensitive than others. The eyes are one of those points, and they typically are important for us to live everyday life and complete tasks. 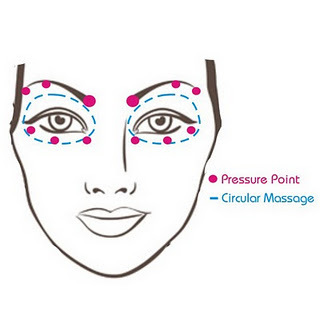 If there are issues or problems with the eyes, treatments like acupressure points for the eyes are helpful to learn. They can improve daily functionality if you just keep practicing. UB-1 (also known as Jingming): This spot is where the inner corner of the eye meets the nose. It is helpful when dealing with glaucoma, hysteria with vision loss and early stage cataracts. This is located on the urinary bladder channel. UB-2 (also known as Zanzhu): Also located on the urinary bladder channel, this is in the depressions of the eyebrows, closest to the nose. Yuyao: In the midpoint of the eyebrow, this point helps with worry, mental strain and strain to the eyes due to over-studying. SJ 23 (also known as Sizhukong): On the triple burner channel, this spot is on the outside end of the eyebrow. It can help with facial issues and other eye problems. GB 1 (also known as Tongziliao): On the gall bladder channel, the outside corner of the eye sockets where the cavity is. This helps with sore eyes that are red, dry, itchy eyes and blurred vision. ST 1 (also known as Chenggi): This is directly below the pupil of the eye, on the infraorbital ridge. This is a primary point to resolve issues with the eyeball. For each of these points, the recommended pressure is gentle massage, starting with B1-1 and continuing up and outward from that position. Each point should be your focus for roughly 10 seconds. This can be done repeatedly at intervals throughout the day. It is recommended to practice deep breathing while you are doing the massage in order to ensure the eye is getting enough oxygen to stay healthy. Make sure to go slowly and pay equal attention to each area. Some people consider the spot directly between the eyebrows, at the spot where the junction of T, would be the third eye. Press on this spot gently for seven to eight minutes. 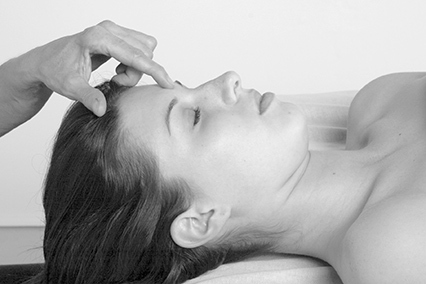 As one of important acupressure points for eyes, this can help relieve emotional stress and improve one's vision. Directly below the inner edge of each eyebrow and alongside the nose is the area considered to be the bridge of the nose. Applying slight pressure to both sides at once with one's thumbs can greatly help with fatigue and eye strain. 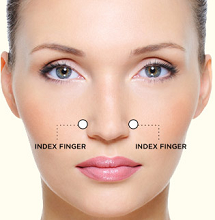 Apply pressure to each side of the nose, just above the flare of the nostril. This can help with blurred vision and nasal congestion. It should be done for five minutes every day for full benefit. 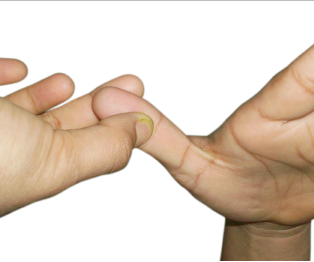 The tips of the thumbs are directly connected to the eye muscles. Thus, this is also one of the acupressure points for eyes. Gently massaging the tip of one thumb with the other thumb can bring about relief to the pain and strain in these muscles. Doing so regularly helps improve the eyesight.